Riot-web new version coming out so soon. So soon! It looks and runs great, you can use it today at https://riot.im/develop. Includes a labs flag for displaying custom tags, which I love. Watch the vid. lots of people coming to chat at the stall to say things like "hi" or "I like Matrix" or "what is Matrix? … wow that sounds amazing, how can I get involved?" If you didn't yet, take a look at the summary blogpost, which also contains videos of both talks. With the release of Server to Server Spec r0.1, Synapse 0.99.0 is shipping now. Synapse 1.0.0 will be compliant with r0.1 and the goal of Synapse 0.99.0 is to act as a stepping stone to Synapse 1.0. Synapse 0.99.0 supports the r0.1 release of the server to server specification, but is compatible with both the legacy Matrix federation behaviour (pre-r0.1) as well as post-r0.1 behaviour, in order to allow for a smooth upgrade across the federation. It is critical that all admins upgrade to 0.99.0 and configure a valid TLS certificate. Admins will have 1 month to do so, after which 1.0.0 will be released and those servers without a valid certificate will no longer be able to federate with >= 1.0.0 servers. Please read the announcement post and be sure to come and chat in #synapse:matrix.org if you need help! Matrix.org has applied to be a GSOC (Google Summer of Code) mentoring organisation. If your matrix project has a feature a summer student could tackle and you have the time to mentor them over the summer, why not add a project idea to our website by submitting a PR to this repo. Feel free to ask questions in #gsoc:matrix.org as well. matrix-puppet-hangouts version 0.1.0 has been released! This release adds bidirectional (Hangouts -> Matrix and Matrix -> Hangouts) image support! It also bumps the version of matrix-puppet-bridge (the common core of matrix-puppet-bridge bridges, which handles most of the stuff that's the same between different third-party service bridges, and makes implementing new matrix-puppet-bridge bridges easier) required to 1.16.2, the current latest, for recent bugfixes that improve all matrix-puppet-bridge bridges. 0.1.0 also requires Python 3.5+, for async. Older versions of python3 won't work. PRs getting python3 < 3.5 working again are welcome. This week I have been hard at work fixing a lot of the bugs that have cropped up from bifrost's rapid development. We now have a docker image available (https://github.com/matrix-org/matrix-bifrost). matrix-media-repo now supports .well-known server delegation (compatible with Synapse 0.99 and r0.1 of the server-server specification), among many other bug fixes and improvements. Actually validating the certificates presented by servers will be implemented alongside Synapse 1.0's requirement for it. Dimension now supports .well-known server delegation (compatible with Synapse 0.99 and r0.1 of the server-server specification). Actually validating the certificates presented by servers will be implemented alongside Synapse 1.0's requirement for it. mxisd v1.3.0-rc.3 is out. This is hopefully the last RC before release, but we would like as much testing as possible! the v1.3 branch is a big enhancement on the previous release with big performance and privacy improvements. It's smaller, faster, stronger and protects you privacy even better than before! You know you want it! matrix-docker-ansible-deploy now supports Synapse v0.99 and should be ready for Synapse v1.0. If you're using the playbook to manage your Matrix server you should upgrade soon. I have been using these playbooks to test my own homeserver deployment and am happy. After seeing a demo at FOSDEM of Tchap, the app the French government uses to access their Matrix network, I decided to try to get it to work as a general-purpose Matrix client. The app uses email and password to log in, and infers the homeserver address from the homeserver name. So to get it to work, I had to patch the app and write a little proxy so it gets the proper homeserver (and optionally identity server) from an email address. 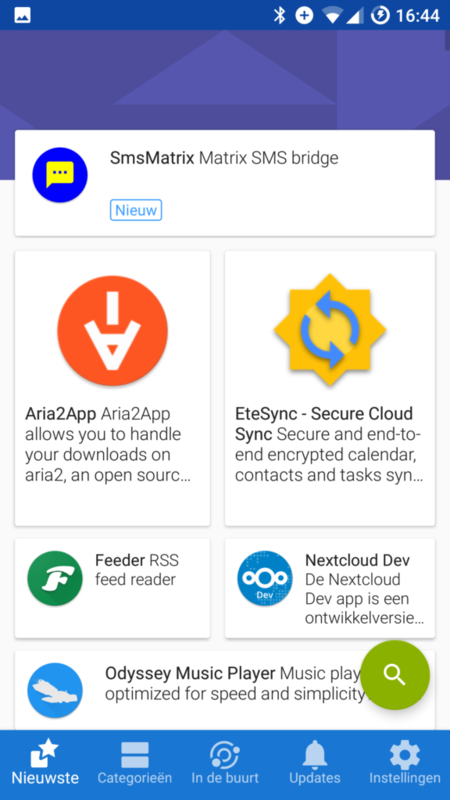 A patched version of Tchap can be found at https://github.com/14mRh4X0r/tchap-android, code for the proxy at https://git.snt.utwente.nl/14mRh4X0r/tchap-proxy. At the moment it's very crude, and images/files don't work since the virus scan API is unimplemented, but at least it can be used outside the French government. ? Valere has worked on Riot Android Notifications, we intend to merge this work on develop at the beginning of the next Sprint. I opened up the .NET SDK project for the first time in two years and revived it to just about work with a r0.4.0 home server. Its now based on .NET core 2.0. 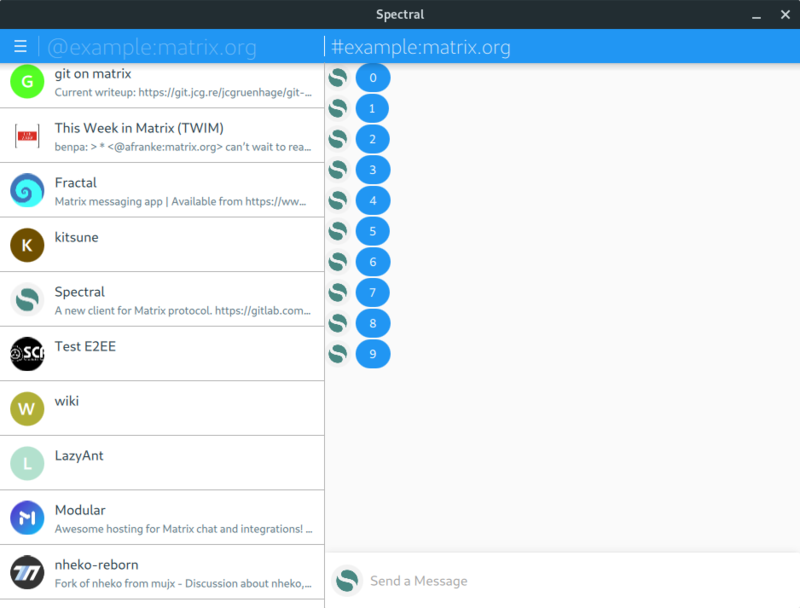 I'm porting Spectral to KDE Plasma Mobile with Kirigami framework. This provides full convergence and mobile support. Some progress pictures below, desktop and mobile version. -snapshots (-current) distribution. py-phonenumbers (?) and py-service_identity received updates to ports. py-prometheus_client, py-daemonize and py-frozendict are ported ready and waiting to be given "ok" at OpenBSD's [email protected] mailing list. Phew! That was a lot! See you next week, and if you have a project you'd like to see featured in This Week in Matrix, come chat to us in #twim:matrix.org!